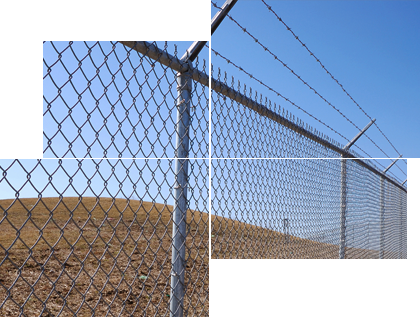 At Ace Fence Company, we have installed chain link fences for residential and commercial properties and special applications. Chain link fences are often used when clients need to contain their yard, business property, properties in warehouses, yet do not want to disrupt their view. The chain link options offered today are much different than many years ago, enabling you to have a beautiful fence that provides a view and the security you need at the same time. Chain link is offered in two materials: galvanized steel and color-coated, giving you options for aesthetic appeal as well as durability. Galvanized steel fences are the traditional choice and provide the most durability. Galvanized steel is rust proof, which means it provides you with long lasting beauty for many decades. We provide a variety of different heights to help you provide the level of security you need for your yard or business. In addition, we can help you design the right gate to match your chain link fence to enhance the security of your property. Color-coated chain link fences add beauty to a secure fencing option. We offer a variety of colors to help you match your home or business. Our specialists will help you decide which color would work the best on your property based on the existing colors to provide the most appealing appearance. Color-coated chain link fences need a little more maintenance than galvanized steel, but they add a layer of beauty that galvanized steel does not offer. Chain link fences are a durable, affordable, and beautiful option for your yard when your main need is security or to fence off your property lines. Contact us today to get started on your chain link fence needs!